02:25 — Stranger Things: Season three dated. 03:38 — Batwoman: The CW orders a pilot. 05:25 — June Whitfield: DEAD! 07:22 — W. Morgan Sheppard: DEAD! 08:52 — Doctor Who: Better quality audio found for some missing episodes. 11:21 – Shatner Roulette #1. 16:07 – Doctor Who: Resolution. 41:41 – Shatner Roulette #2. 45:24 – Doctor Who: Seasonal Ranking. 76:02 – Shatner Roulette #3. 80:07 – Emails and listener feedback. 103:42 – Farewell for this podcast! 104:40 — End theme, disclaimer, copyright, etc. Wikipedia: List of Doctor Who episodes (2005 to present). 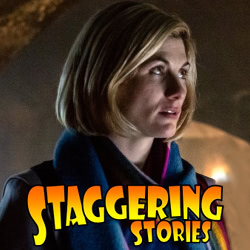 This entry was posted on Sunday, January 13th, 2019 at 09:00 and is filed under Doctor Who, podcast, review, Sci-Fi, staggering stories, Staggering Stories Podcast, Staggering Stories Regular Podcast, tv. You can follow any responses to this entry through the RSS 2.0 feed. You can leave a response, or trackback from your own site.